How To Draw Animals - Made Easy! Learn how to draw different animals with this brilliantly entertaining, easy to follow creativity pack. This fantastic set has everything needed to make drawing your favourite animals easy. Follow the simple step-by-step instruction book and learn how to draw 28 different animals, including a tiger, whale, monkey and even a meerkat. Practice your animal drawing skills on the handy sketch pad with HB pencil and nine high quality colouring pencils, complete with a sharpener and eraser. 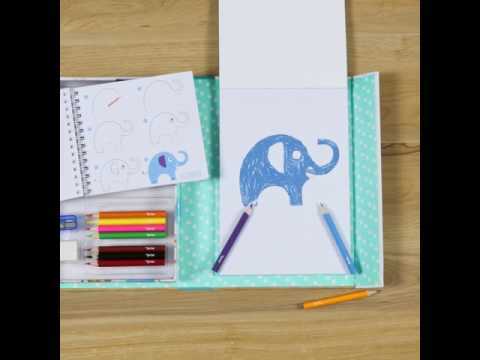 Compact in design, portable and ideal for creativity on the go - drawing animals is a skill everyone loves to learn!